By the 1800s, the impact of European farming had made it very difficult for Aboriginal people to find traditional sources of food and shelter. Many Aborigines were dying from starvation, introduced disease and confrontations with the settlers. In Victoria, Aboriginal leaders began petitioning local authorities for land for their people, and in 1863 they were allocated a site on which Indigenous people could live as a community. This site became known as the Coranderrk mission. Coranderrk's first manager, John Green, worked closely with Indigenous leaders to build housing and plant crops of hops, wheat and vegetables on the site. By the mid 1870s, Coranderrk had become a large village with a schoolhouse, bakery and butcher. The growing community's hard work and dedication had made Coranderrk a highly productive farm and a valuable piece of land. ...there has sprung up in certain quarters a large amount of so-called interest in the welfare of the Coranderrk natives. It has been suggested that for the benefit of their health, they ought to be shifted up to the Murray. The Coranderrk mission was established on land that was a long way from settlers. As the mission prospered and Melbourne's boundaries expanded, the authorities thought the Coranderrk land had become too valuable to be left to Aborigines. The community fought to protect its home, and led by William Barak, they sent many deputations to Melbourne over the next ten years to try to stop the Board closing the mission. However, the Board provided no resources for Coranderrk's upkeep during this time. Living conditions subsequently deteriorated, and illness swept through the community. 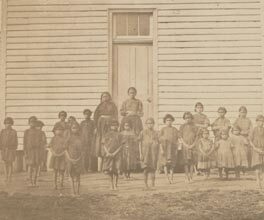 In 1886, the young people of Coranderrk were forced to leave the site because of the Act to Provide for the Protection and Management of the Aboriginal Natives of Victoria (or ‘Half-caste Act'). The Act specified that no person of mixed descent under the age of 34 could live on an Aboriginal reserve. This meant that the running of the mission was left to an ageing community. Declining numbers gave the government an argument for moving the community off the mission. So in 1924, Coranderrk closed.